The handcrafted wood urn Amboise l is an exceptionally crafted masterpiece. Classics style with a twist. The handmade top boasts a gorgeous bordered scheme, drawing meaning and light from central France, where the town of Amboise is situated. Interior is velvet lined so that a temporary urn will fit comfortably inside. Comes packaged in a velvet bag to protect the finish. 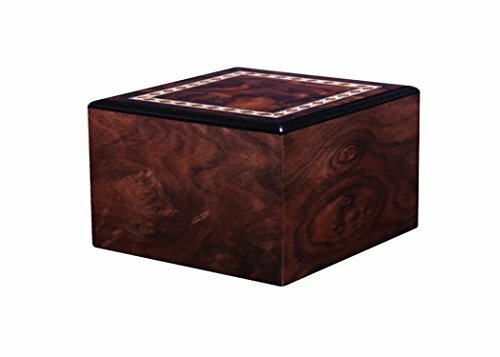 This is a large size wood urn and is the perfect funeral/memorial urn that fits up to 235 cu inches (up to 225 lbs.). Exterior dimensions: 9.1" x 7.4" x 5.2"